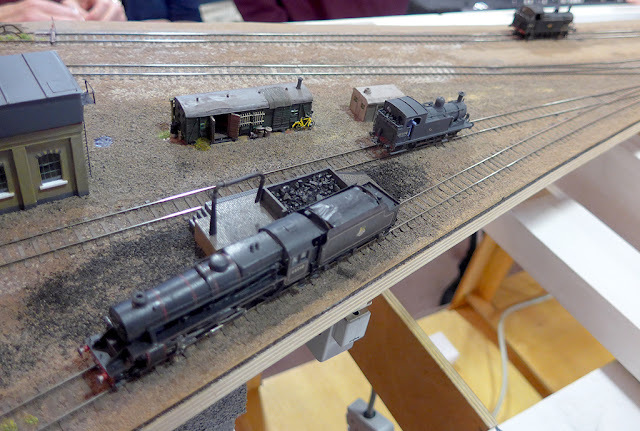 On the weekend of 14 - 15 April, Lightermans Yard was a guest layout at the Crawley MRS Show held at a school hall in Horsham. Summer struck on the Saturday, when apparently, most punters took advantage of the sun. However, the show was reasonably well attended on both days, and especially on Sunday when the weather abandoned it's attempt to launch summer! The layout was transported to Horsham on Friday evening and set up by Pete K, Alan S and Keith. 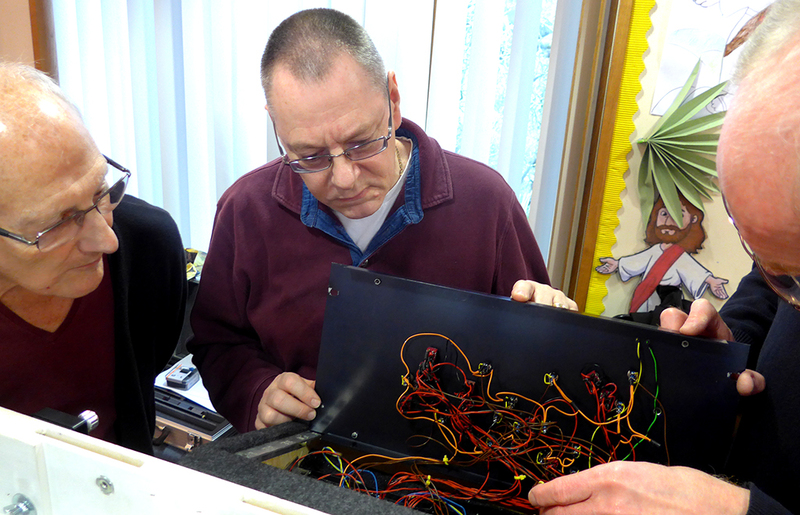 They were joined by Gordon and Richard on Saturday, and Richard on Sunday. Operating got off to a good start, but the uncouplers failed again, resulting in the 'hand of god' appearing rather too often. 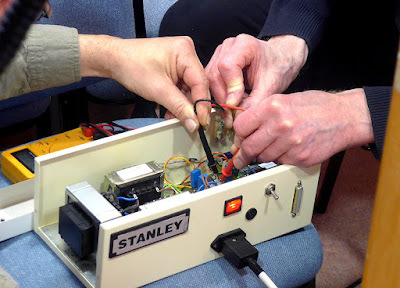 After some investigations by Keith and Pete into the power supply, the problem was resolved and we were able to restore proper working. As operators we had a great time running the 'Yard' as it should be; trip locos - steam and diesel - bringing in a train to be distributed into Beresford's warehouse or the Express Dairy siding (by a 'Terrier') by the G6; outward trains being assembled on the exchange siding by a 'Jinty' or a Class 8 before finally having a brake van added by the G6 and being re-united with a trip locomotive and disappearing into the fiddle yard. Pete in discussion with the show organisers. Views of the main hall and some if the best of the rest. Above; LARAMIE an American '0' gauge model of part of the loco shed and turntable at Laramie in Wyoming. ARUN a charming '0' gauge model of a riverside dock. ...and finally, ready for OFF. An enjoyable weekend! 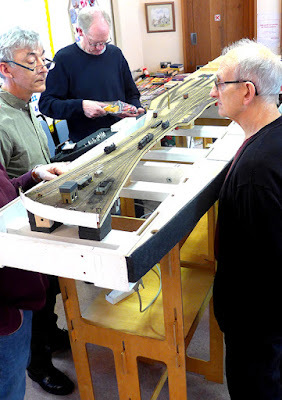 At this month's meeting we used the afternoon to check the layout in preparation for our next outing to the Crawley Model Railway Society exhibition (at Horsham) the following weekend, 14/15 April 2018. 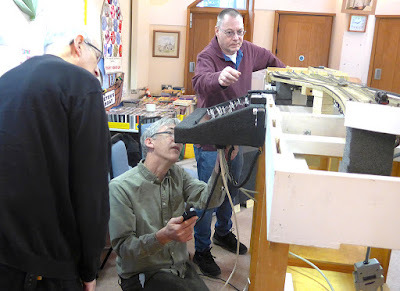 Having assembled the layout to track level, we discovered that, although we had locos running, the magnetic uncouplers were failing layout wide. 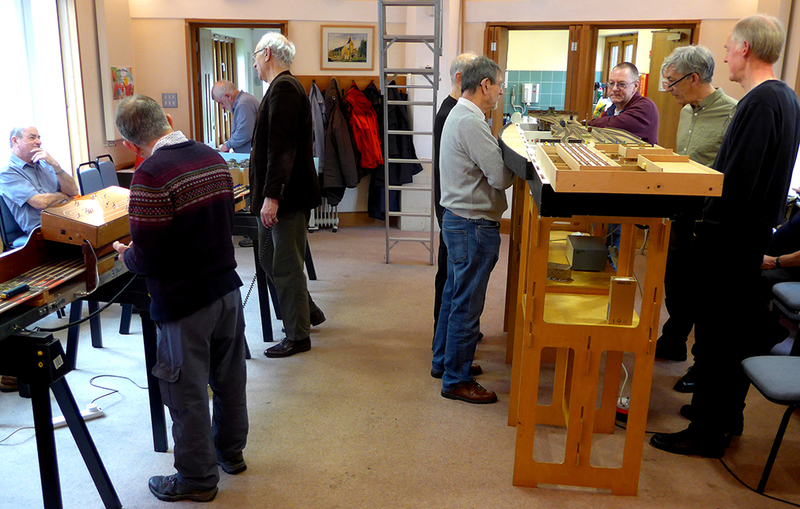 We sometimes forget we meet in a church hall, but there was no apparent external help (beats me boss!) when confronted by the control panel trail of wiring. The fault was finally diagnosed and fixed. This month's guest locomotive is David Smith's recently completed Black Five 4-6-0. There are a few problems over weight distribution which at the moment causes intermittent wheel slip. However, the locomotive looks very good, and after discussion about how to manage the the weight problem, the loco will no doubt be seen on Lightermans Yard in the future. (below) The Black Five joins last month's locomotive, ex-LSWR G6 built by Pete King and Alan Smith's 2mm Jinty conversion. Final track inspection ready for packing and loading into two cars ready for the exhibition build on Friday for the weekend show. 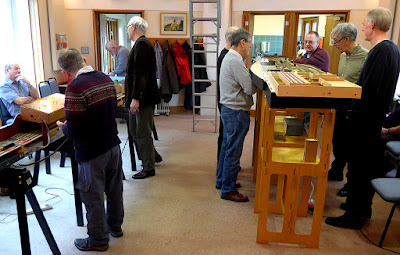 An exhibition report will be posted here on the blog. When are at 'home' we operate our 2mm scale Lightermans Yard alongside 'N' gauge colleagues of the Swanley Model Railway Club.